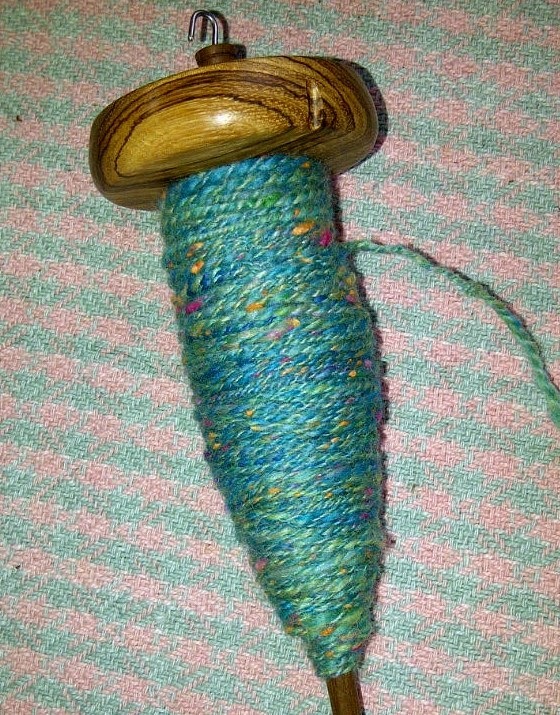 Last Friday and Saturday morning, I was completely immersed in teaching spindle spinning. Friday morning I worked with beginners. Saturday morning was with a slightly more advanced group of spindlers. It was all great fun. I love the joy on people’s faces when things fall into place and all of a sudden — they get it! They can make yarn. They understand the rhythm between the spin on the spindle and the amount of fibre that needs to be drafted to keep the spindle spinning and giving the twist a place to go. The classes are four hours each. Four hours is just enough time when you are working with beginners – but it is too long for the advanced group. This is because the advanced group can spin right from the first moment of the class. At about the 2 1/2 hour mark, arms and shoulders are sore, and people need a break from spinning. So to accommodate that I introduced a new activity – making funky rolags. Using simple tools like hand cards, we blended dyed rovings with tussah silk, Fire Star, silk noils and Soffsilk. I included 5 gram packets of dyed silk noil in the materials kit. Result is a multi-textured rolag that you spin up. This two-ply yarn (65 yards, 60 metres) was the result of eight rolags. It is difficult to make them exact, but if you use the similar amounts of base fibre colours and the same embellishments, it will all work together giving you a funky yarn. This activity gave everyone a break from spinning and gave them the chance to practice or even learn a new skill of blending fibre on hand cards. We each made up a bunch of rolags and then returned to spinning to see what kind of yarn they would make. I love the look of this yarn and how easy it is to make on hand carders. I think I’ll be making a lot more yarn like this in the future. This entry was posted in fibreswest 2014, funky rolags, spin on March 30, 2014 by DianaTwiss.